I created custom doctype called Label Printer and i made two Label Printers: 1.Citizen and 2. Zebra. In print_layout.html, how can we add Label Printer doc options(1.Citizen and 2. 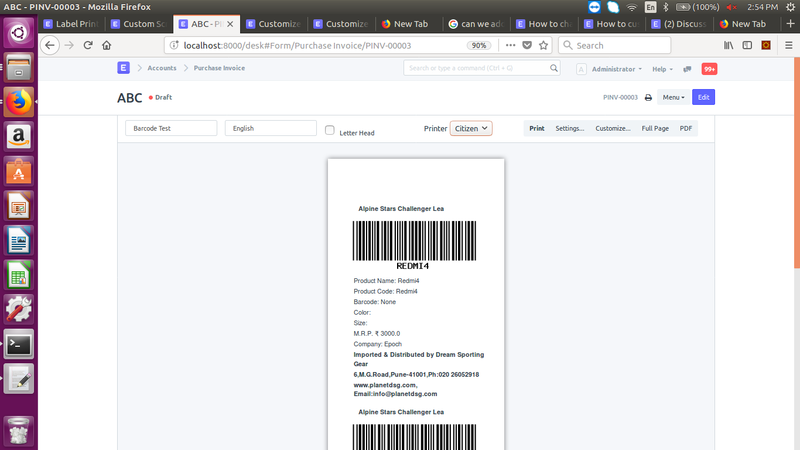 Zebra) and is possible to get items details of any doc(Purchase Invoice/Purchase Receipt) when selection of Citizen/Zebra printer? Right now I added manually in print_layout.html file. Please find in attached one. Right now we are implementing through custom script for selecting Printer options and making .PRN file for Purchase Invoice Items. The implementation almost done. I will share you after completion. @ragh thanks a lot for sharing. Could you share your code for nhance.api.make_prnfile method? @ragh how to create the file prn_file or how to design my own? how to send prn_file to the printer? Sorry! We haven’t tried with the custom prn file format. Customer/Client will take care of, To send prn_file to the printer. @ragh thanks, I figure out how to print it. It should be copied to network printer then will get print . Actually the design things we got from client.